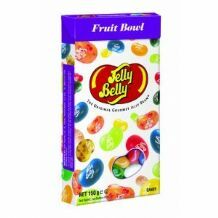 Jelly Belly Ice-Cream Parlour Jelly Beans Mix 100g. A new and unusual collection of 5 flavours of Gourmet Jelly Belly Jelly Beans. Flavours: Chocolate Chunk, Chocolate Mint, Strawberry Sundae, Birthday Cake, Apple Pie. ingredients: sugar, glucose syrup, modified corn starch, strawberry puree, natural and artificial flavours, colours: E100, E102, E110, E129, E132, E133, E150d, E171; cocoa powder, chocolate liquor, acidity regulators: E330; salt, cocoa butter, glazing agents: E901, E903, E904; cinnamon, tapioca dextrin, soy lecithin. suitable for vegetarians. kosher. gluten free, fat free, geltine free. manufactured in a factory that processes nuts.